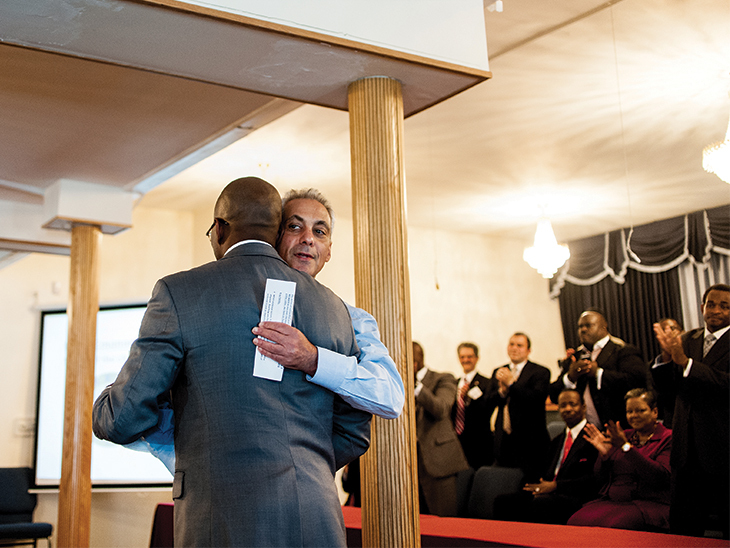 Mayor Rahm Emanuel has reached out to black clergy to try and win support among African-Americans. In September, he was with Rev. Christopher Harris of Bright Star Church for the launch of the Bronzeville Dream Center, a program to combat violence and provide counseling and support to victims. Photo by William Camargo. Schools and jobs are the hottest issues in the upcoming mayoral race. So it seemed a logical fit for The Chicago Reporter and Catalyst Chicago to collaborate on a joint publication about a February election that is actually shaping up to be about one big issue: opportunity. Access to quality public education is at the center of the American success story and a lynchpin of the civil rights agenda. With a good education, any child, irrespective of race or class, can potentially climb to the top rung of the economic ladder. Or so goes the narrative. But in many communities across the country that narrative unraveled long ago and people are now tumbling down the ladder of opportunity. That is true in Chicago, where the African-American community bears the brunt of a double devastation: shuttered neighborhood schools and a staggering unemployment rate, according to figures compiled from city, federal and Chicago Public Schools data. Chicago has the highest black unemployment rate among the nation’s five largest cities—25 percent, compared to 19 percent in Philadelphia, 18 percent in Los Angeles, 15 percent in Houston and 14 percent in New York City—based on 2013 figures. Public sector jobs, traditionally a route to the middle class for African-Americans, have been vanishing in recent years. City workers from black ZIP codes account for 40 percent of the 5,000 jobs lost since 2009 (two years before Emanuel took office). Those layoffs don’t include the 1,691 school system employees from black ZIP codes who lost their jobs since 2011. White households in Chicago with an income of $100,000 a year now outnumber black households by a 6-to-1 ratio. All of the economic woes in the black community cannot be laid at Emanuel’s feet, and his supporters argue that he has amassed public and private dollars to address some of the problems. In this joint issue, Catalyst Deputy Editor Sarah Karp examines the potential effect of the mayor’s education policies on his re-election bid. Associate Editor Melissa Sanchez explains how the Chicago Teachers Union and its progressive allies are seeking to make inroads in City Hall. Sanchez also talked with former mayoral candidate Miguel del Valle about the upcoming election and the state of Latino political power in the city. And the Reporter’s Ade Emmanuel explores the reasons behind the city’s high black unemployment rate at chicagoreporter.com.